Welcome to Day 2 of our 5 for 5 Thanksgiving Blog Event. Today our theme is "Pumpkin". We are all sharing a project with a pumpkin focus. Each day our 5 Designers will post a Thanksgiving Inspired Project based on a theme. Some of us are offering prizes, so be sure to visit all the links below and leave comments. For my project I used a piece of wood. I painted it with a light brown acrylic paint. 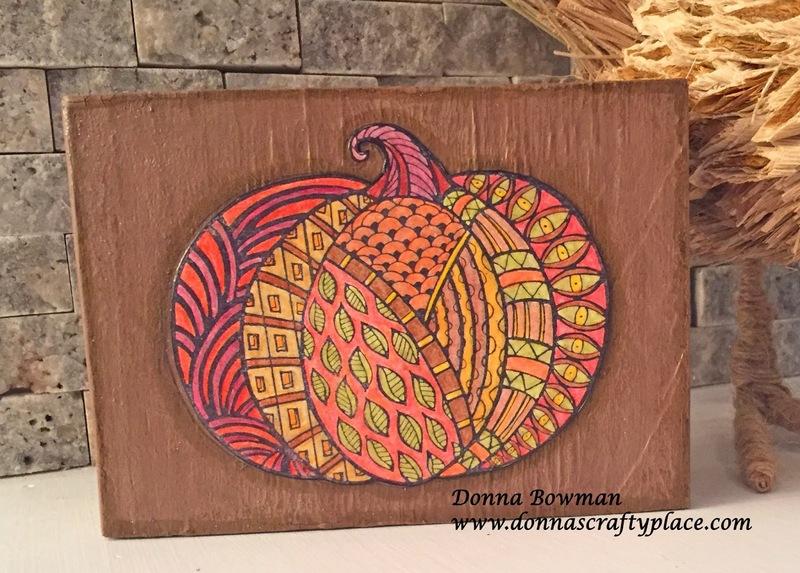 I stamped the pumpkin with Archival Ink and colored it with colored pencils. The pumpkin stamp is from Just For Fun Rubber Stamps. I inked the edges of the pumpkin and block with a Faber Castell Design Memory Craft Big Brush Pen. 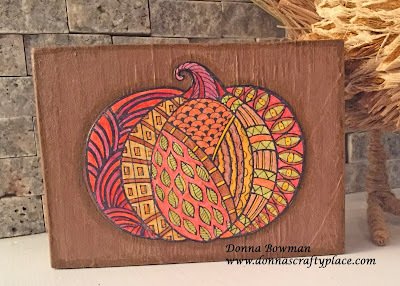 Finally, I adhered the pumpkin to the block with DecoArt decoupage. Thanks for stopping by and be sure to check out all the designers blogs below for more Thanksgiving Inspiration. So cool Donna, looks like you had a blast colouring this! Wow...wow...wow...it's amazing,gorgeous,outstanding,unique! What can I say: I'm speechless!